There are many ways to organize a sales force for a software or hardware company. In my opinion, there is no one “right” way. There is only the BEST way for the unique circumstances of your current company. What stage of development is your company in? This is important, because an early stage company may not have the resources to fully fund an outside sales force that may be ideal for its particular product/market situation. Or the company may want to sell primarily via an inside sales force, but hasn’t had enough early success or nailed down the sales process sufficiently to sell effectively through this less “high touch” method. 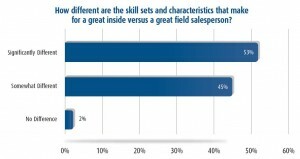 At this stage, every sale may need to be higher-touch than an inside sales force can provide. Stage of development can be just as important as what the ideal “steady state” organization will ultimately look like in a designing a current sales force structure — don’t over shoot your development stage in designing your sales organization. What are you asking your sales force to do? Are you using your sales force primarily as closers, supported by strong marketing, etc — or will your sales force be doing a lot of cold calling, handling the customer “cradle to grave”? In general the more you are asking your sales force to do, the more “high touch” the structure needs to be. What markets are you targeting? In some markets (such as many enterprise IT market segments) an outside rep “knocking on the customer’s door” is absolutely expected by some customers and is therefore essential. In other markets (like many SMB markets), this type of attention may be considered a nuisance, not a service. It’s important to understand what the target customers want and are expecting in a sales interface. What are your product price points? The implications of this question are usually well understood. Higher priced products can support a more expensive outside sales force and may require one to make the sale. Lower priced products can’t usually be sold profitably this way, and an inbound or outbound telesales operation (possibly in conjunction with channels) is often the optimal structure. Is your product more of a commodity sale or is there a longer, more complex sales cycle? Commodities lend themselves to lower cost inside sales structures, as well as a higher mix of channels. The more complex your sales cycle, the more likely your company will need a captive, outside direct sales force to serve at least part of your market segment. This is the classic sales rep style that has been around nearly since the beginning of time. In the “old days” even consumer products were often sold this way (those of a certain age can remember the “door to door” Fuller Brush Salesmen). But this is the most expensive form of sales person and depending upon the market, products and other factors, it is not always the most efficient or even most effective. There are still a lot of companies that sell almost exclusively through outside direct sales forces. But in many companies where direct outside sales reps do exist, they are often used more sparingly for specific situations such as the key end user accounts and OEMs, in combination with other types of reps and channels to most efficiently cover the entire target market. This is a favorite form of sales rep for commodity products, companies that sell heavily through third party channels and other inexpensive, higher volume products. However, remember that every situation is different. A non-commodity enterprise SaaS product which has been optimized for ease-of-use may do very well paired with an inside sales force. Inside reps can also be used effectively in a “teamed” approach with outside reps, helping to optimize an overall territory. They may source or qualify leads for the outside reps, handle smaller accounts in the territory or generally act as a “junior sales rep” to the more senior outside reps. This rep type is more or less of my own invention (the term is at least). This sales rep is part outside rep, part inside rep. A rep of this type would be appropriate for those “tweener” products and markets, which don’t fit neatly into a pure inside or outside model. For example, software products with an average sales price of $1-10k–too low cost to be sold strictly through an outside sales force, but maybe too complex or expensive for a pure phone sale. Hybrid reps spend most of their time in the office on the phone, but also travel modestly, maybe one trip/month. Some example “core” reasons for trips might be to staff trade shows, visit channel partners and call on major accounts–then filling up the rest of the week with additional sales calls. This type of rep may be very appropriate for early stage companies that can’t yet afford to build out complete inside and outside sales organizations. This is pretty self-explanatory, but not every software or hardware company can afford a classical, full-time sales manager. Often you will see individual reps reporting to a manager of another function in early stage startups, and occasionally you will see the concept of a “producing sales manager”, who has line sales responsibilities in addition to management. The sales manager personnel type is very important to setting the tone for your sales organization and is applicable to managing all rep types within any organizational structure. This is probably the most common organizational structure, which may include any of the sales reps types listed above who are assigned to specific territories. In many cases I favor this arrangement, as it tends to be the most unambiguous to measure and manage. The downside is that certain regions can prove to be much more naturally fertile than others, which can make the management process more difficult to perform fairly among the reps. If you give a more fertile territory to one rep over another, he/she is going to make more money and be happier that their counterparts in less fruitful regions. You also may lose the advantages that certain reps may have in terms of contacts or vertical market knowledge which lies outside of their geographic region. This is the second most common sale organizational type which of course tends to be found in companies that make strong use of third-party sales channels. 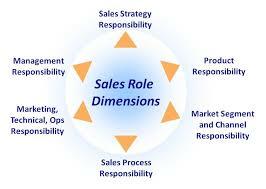 There may be a direct sales force, a VAR or retail sales force, an OEM sales force, and so on. Sometime there is an “intermixing of these organizations, for example, an “overlay” VAR channel rep as part of a direct sales force. Likely the least common of organization types, but one which is very appropriate in certain circumstances. For example, a tech company which has very different value propositions in a number of vertical industries, where “insider status” in important to selling into a particular vertical market, or the product offerings are arranged by vertical market. There are many possible sales organization types and styles for software and hardware companies. Many different ways of organizing a tech sales force can work. Please note that the people you put in the organization are always more important than organizational structure to your company’s ultimate success. But by carefully considering your company’s specific situation and matching your organizational structure to your market, products and available resources, your company will have the best chance of achieving optimal sales results. What do you think is the optimal way to organize a tech company sales force? Post a comment with your own perspective on this important topic. I have an associate that builds commission only sales forces. They assembled a 40,000 person sales force team for Amercian Express. If you have clients that could use that service, let me know.